Synergist is project management and job costing software for project-based businesses including creative and digital agencies and environmental and engineering consultancies, providing them with a comprehensive end-to-end platform that streamlines and simplifies the whole process. From brief all the way through the final invoice, Synergist gives users total control over all phases of their projects from a single, unified system. 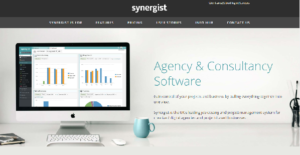 With Synergist, users are able to consolidate their systems and eliminate information silos, placing everyone across the agency on the same page. It enables them to store all the information they need in one place, submit requests and updates. It also allows for quick and easy monitoring of costs and budget as well as the efficient management and rapid allocation of their resources. Synergist presents you with total visibility over your projects and provides you with the ability to drill down to see how data is generated, delivering you the biggest, clearest picture. You and your team are able to recognize issues and anomalies, trends, opportunities, and patterns that you can analyze for immediate action and/or future learnings. As a centralized system that unifies all facets of your project, Synergist puts you in the pilot seat and in charge over critical and unique processes such as time and expense recording, job project costing, accounts integration, scheduling, capacity planning tools, job/project tracking, and CRM to mention a few. All the information you and your team requires for your respective tasks are easily available at a glance, like schedules, resource allocation, cost estimates, deadlines, progress, and running expenses. You can configure your dashboard and have it show only the project data relevant to you and your priorities. This allows you to easily get the information you need and quickly decide on priorities and map out and change your plan of action. For those instances when things don’t go according to plan, Synergist helps reveal the root cause by performing an audit trail and identify who is accountable. It is crucial whenever you are approaching a deadline or a threshold. You can set Synergist to send you a notification when your expenses have hit a specific amount, a deadline is near, and when your projects need more manpower or resources. Synergist lets you know when your project has hit a snag so you and your team can proactively seek the reason and quickly respond with data-based decisions and actions. What Problems Will Synergist Cloud Solve? 1) Companies can often make mistakes when transferring data from one platform to another. Synergist offers a complete solution – replacing endless spreadsheets and disjointed systems. All information is in one place, information doesn’t need to be re-entered and you’ll always enjoy excellent visibility of what’s really happening in your business. 2) Project software is often rigid and fails to evolve as your business changes and grows. Synergist offers extensive background configuration to match the variety of environments it specializes in. This ensures that as your business develops and requirements change, Synergist will have the flexibility, functionality, and scalability to meet your future needs. 3) Many competitor customers feel the need to change software at some point as they feel as though they are lacking something. Synergist enjoys exceptional levels of client retention and one of the keys to this is the level of service it delivers. From initial sales contact through implementation to on-going support and maintenance, Synergist takes pride in exceeding their clients’ expectations. Its helpdesk team, for example, is staffed by experienced senior staff which ensures over 95% of calls are dealt with during this first contact. Companies have diverse needs and requirements and no software application can be just right in such a scenario. It is futile to try to find a perfect out-of-the-box software system that meets all your business wants. The intelligent thing to do would be to customize the solution for your unique wants, worker skill levels, budget, and other aspects. For these reasons, do not hurry and invest in well-publicized trendy systems. Though these may be widely used, they may not be the perfect fit for your specific requirements. Do your research, look into each short-listed system in detail, read a few Synergist Cloud reviews, call the vendor for clarifications, and finally select the product that provides what you want. How Much Does Synergist Cloud Cost? Synergist Cloud offers the following SMB and enterprise pricing packages for users to choose from. Give the details a look, and select the best plan for your business. We realize that when you make a decision to buy Project Management Software it’s important not only to see how experts evaluate it in their reviews, but also to find out if the real people and companies that buy it are actually satisfied with the product. That’s why we’ve created our behavior-based Customer Satisfaction Algorithm™ that gathers customer reviews, comments and Synergist Cloud reviews across a wide range of social media sites. The data is then presented in an easy to digest form showing how many people had positive and negative experience with Synergist Cloud. With that information at hand you should be equipped to make an informed buying decision that you won’t regret. What are Synergist Cloud pricing details? What integrations are available for Synergist Cloud?